The Camargue region is a fascinating natural water-maze in a unique setting. 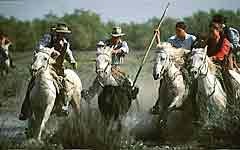 Unique too, its specifie rural activity, with its roaming herds of black bulls and white horses, its cowboys, its bird-sanctuaries and countless flamingos, and the Mistral wind blowing wild over the rice-fields or briny reed-beds. This nature reserve reaches South to the seafront where you can explore the pilgrimage town of "Les Saintes Maries de la Mer" or the fortified city of Aigues Mortes surrounded by salt-marshes, and all along the coastline, unspoilt beaches and seaside leisure activities. Arles, the capital town of the Camargue awaits you with its ancient vestiges, its vast Roman amphitheatre where exciting bull-fights take palace, its colourful bustling open-air markets, and the endless games of bowls in the public gardens ' shade.